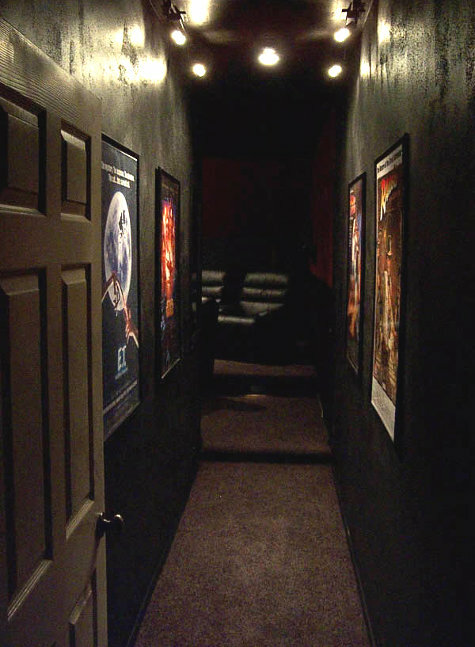 As can be seen below, the entrance to the home theater is a hallway. This worked out nicely as it allowed us to place movie posters on both sides of the hallway for people to see as they enter the room. I mounted halogen track lights on the ceiling (each light pointed at a poster). It gives great ambience and really gets people in the "movie" mood right from the start. 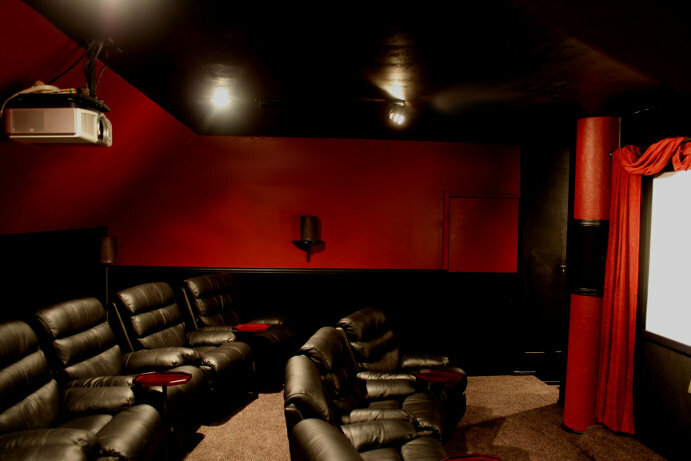 The front of the home theater turned out really nicely. After placing the front left and right speakers in the columns, I stapled speaker cloth (taut) around the front of the column and then mounted flexible molding (that matched the wood molding in the rest of the room). There is quite a variety of flexible molding available and it allows for some creative uses. 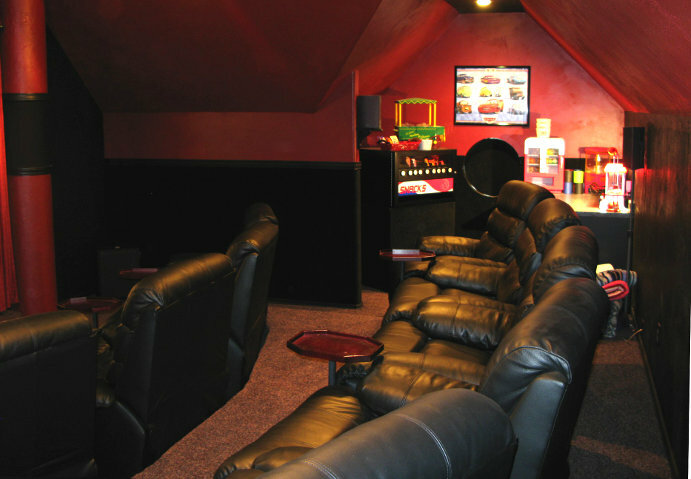 One of the biggest hits of movie night is the snack area. We purchased a small soda cooler/dispenser, a snack vending machine, a nacho machine and more. Before the movie starts, we usher people over to the snack area to get drinks, popcorn, candy or whatever we have available. The snack vending machine currently takes quarters. I was planning on reconfiguring it so it would be free, but before I could do that, I realized that people got a real kick out of placing the quarters in the machine and turning the knob. Now, we keep a pile of quarters in a small container near the machine and allow people to use them to get their treats. 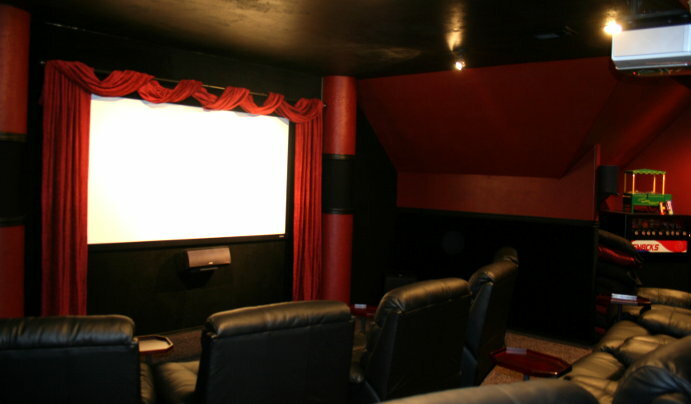 It took about six months of work to take the home theater from an idea to reality. It was a joy to build. Our guests love it and enjoy the experience. Although I love watching movies in it, the memories of the project itself are almost more meaningful to me. I can't wait to build the next one.